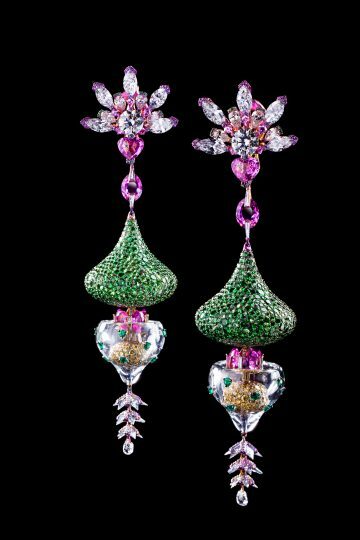 Celebrated jewellery designer Wallace Chan is set to return to the renowned TEFAF New York Fall in October to showcase his highly original and artistic jewellery and art creations. He will exhibit more than 20 pieces of jewellery and one titanium sculpture, most of which will be on show in New York for the first time. Highlights of Chan’s new collection include the Wonders of Life earrings, which are inspired by neurons joining. The result is a brilliant floral structure that symbolises life and hope. A yellow diamond-encrusted orb is contained within a crystal realm to signify how the seeds of life blossom into flowers. A heart-shaped pink sapphire is set at the base of the petals, unifying the flower and its roots and representing growth and transformation, as well as the heart’s aspirations. 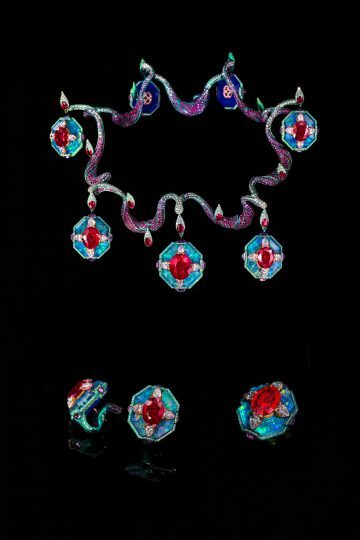 The Music on My Mind suite of necklace, earrings and ring features 10 extremely rare Burmese rubies totalling 77.538ct. With diamonds, lapis lazuli, crystal and opal set alongside the rubies, a symphonic movement involving light, colours and shapes comes to life. Lapis lazuli and opal slices are set inside the crystals to generate diverse layers of elusive blue, contrasting with the rich red colour of rubies. Also in striking red, the Ruby Castle ring is inspired by the mysterious microscopic world of nature found inside a gemstone. Here, Chan has engaged in castle building on a mini scale to reveal the gem’s inner beauty with an unusual construction. 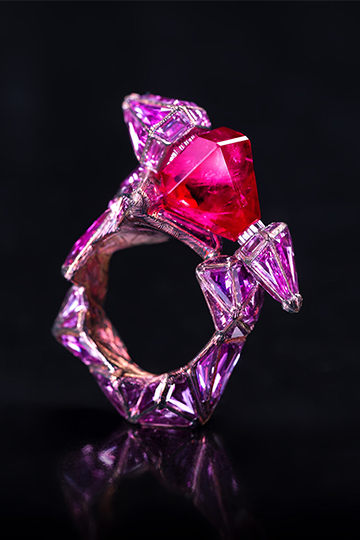 In a coordinated red colour scheme, pink sapphires are set in a geometric and rhythmic form to show the meticulous layers of the design. Finally, the new Sea of Joy brooch sees the body of the fish created from a piece of colourful opal. Translucent crystal is set on top of the sparkling opal to reflect the gemstone’s magical glow. 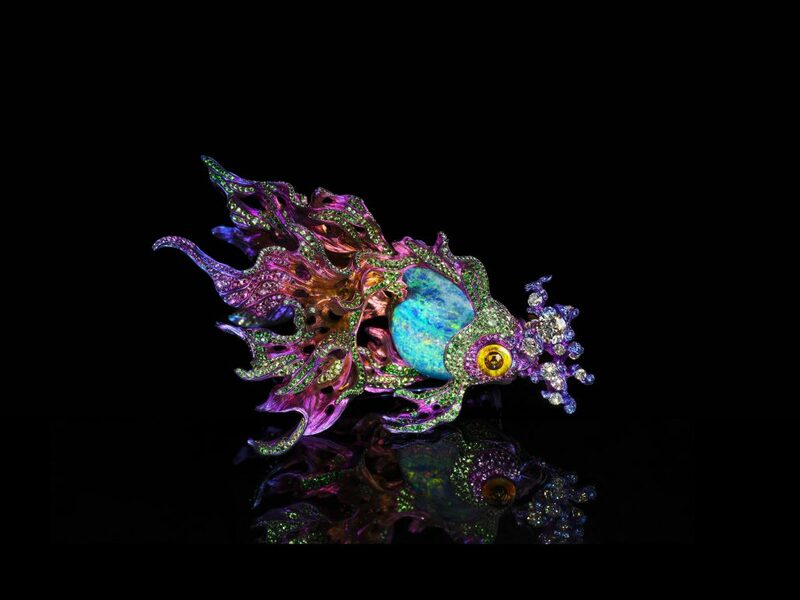 This piece is full of stunning and elaborate details: the eyes of the fish alone contain many layers of exquisitely carved crystal and gemstones. 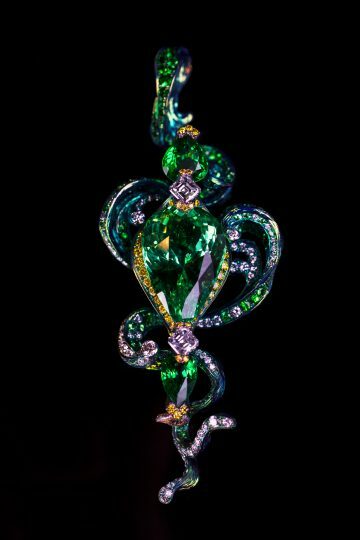 The brooch, together with its base made of raw crystal and titanium, form one harmonious piece of visual artwork. The TEFAF New York fair will take place at the Park Avenue Armory from 27 October to 1 November and is set to attract prestigious collectors, experts, curators and art lovers from around the world.